A Brief History The Blue Weimaraner has a distinct charcoal gray colored coat. The difference between a Blue and a Gray Weimaraner is in the tone of the color, not the deepness or darkness of the color. Therefore, it is possible to have a Gray dog that is darker than a Blue one although usually grays are lighter than blues. Genetically speaking, Blues are dilute blacks and Grays are dilute browns. The genetics are quite simple; Blue is dominant to Gray, which means that you must have one Blue parent to have Blue puppies, and you can never get Blue puppies from two Gray parents. This is because if a dog is carrying a Blue gene, you will always see the Blue color. The Blue color has been controversial in Weimaraner circles since the late 1940’s when one of the first Weimaraners imported from Germany hit U.S. shores. His name was Cäsar von Gaiberg, also known as “Tell.” He was an unusually dark Weimaraner, and is considered the progenitor of the Blues in America. The German Weimaraner Club issued Tell’s papers and as such considered him a purebred Weimaraner. The AKC accepted these papers and also registered him. Shortly after issuing his papers and his registration with the AKC, the Germans seemed to have changed their minds about Tell’s purebred status. However, there is no indication that his German registration had been revoked, nor is there solid documentation that he was crossbred although many believed that that Tell was a product of cross breeding. Others believe that the blue color occurred due to a genetic mutation. There are also those that believe the blue color was simply called mouse-gray in Germany and had been around all along. All three of these positions can be well argued, although, to date, no theory has been proven. Most likely we will never know the real answer as to how blues came into being since many documents were lost or destroyed in Germany after WWII. Any AKC registered Weimaraner bred to another purebred AKC registered Weimaraner, regardless of color, is considered purebred and AKC registerable. The Weimaraner Club of America voted to disqualify the blue coat color in 1971, but they may participate in any AKC event. A Blue Weimaraner would be disqualified by the judge in the conformation ring at a bench show; however, since performance events do not evaluate conformation and disqualifying faults, Blues may compete in obedience, agility, field trials, hunt tests, tracking, etc. They are also welcome to participate in testing with the North American Versatile Hunting Dog Association (NAVHDA), North American Dog Agility Council, Inc. (NADAC) and the International All Breed Canine Association of America (IABCA). They are not allowed to participate in WCA Ratings Tests unless they are altered. Because most reputable breeders do not breed disqualifying faults, Blues have suffered from poor breeding practices over the years. 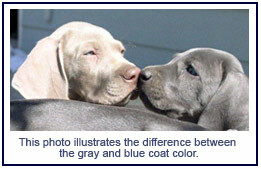 Many breeders target them for their coat color alone and sell Blue Weimaraners as “rare.” Blue Weimaraners are not rare! They are not subject to any health problems related to their coat color, such as Color Mutant Alopecia (sometimes known as Blue Dog Disease or Blue Doberman Disease), any more than Gray Weims. However, a poorly bred Weimaraner of any coat color may be more subject to health or temperament issues. Even if Tell were crossbred, so many generations have now passed that that point is moot. Additionally, Gray offspring from Blue parents are considered to be purebred Gray and will never pass on the blue coat color genes. Some Blues today may descend from champions several generations ago, since the disqualification did not appear until nearly 30 years after Tell arrived to the U.S., and a large majority of well known and well bred Gray Weimaraners have Tell in their background. Blue Weims are Weimaraners through and through, in temperament, physical activity level, etc., and only differ in their coat color. I have been a long time Grey Weim owner here on Long Island, NY and recently rescued a Blue female pup from the Ashville, NC area advertised on the Tarheel site. She and her 3 sisters were dumped at a Kill shelter and were perfect in every way. Thanks to an amazing lady, ALL girls were sent to great homes after very careful screening. My new addition is already hunting and loving life. Me too. Good luck to all bird hunters. He has owned me, Felix Von Blu for over 4 years. Everyone says he is aristocratic and I say he is diplomatic. This wonderful guide communicates in sign language that is simply astounding. If he wants to walk me, he bites my watch then my shoes, obviously saying “time to walk”. He is an extraordinary tracker, able to use the web when necessary, I know that is an extensive claim but I assure you he is not the average dog. These are privileged dogs and deserve loving homes with loving handlers to develop their abilities. So if you are patient & loving and active as can be blues shoes fit well. Misty Blue aka Boo-Boo was my first and only Blue Weimaraner. She lived to be almost 14 years old and was a great dog, though she was wired for sound, just like most weimies. She was a natural with children and practically raised our daughter! She was a fabulous dog and we miss her! We have had 2 Blue weims– so gorgeous and amazing with kids– still a little on the nutty side like most weims. I feel that they aren’t allowed to be shown at AKC shows because they would always win!!! Little can be said about PM Weimaraner’s that hasn’t been said from Montana (PMweims@3rivers.net) to Weimar Germany, they come from the mother country to get improved upon genetic stock. Imagine that! The Germans requesting her stud service. Dawna Miller is riding the crest of years of hard work and diligence. Nothing can beat doing what you love, for love. Hands down, I wouldn’t go anywhere else for my favorite breed.